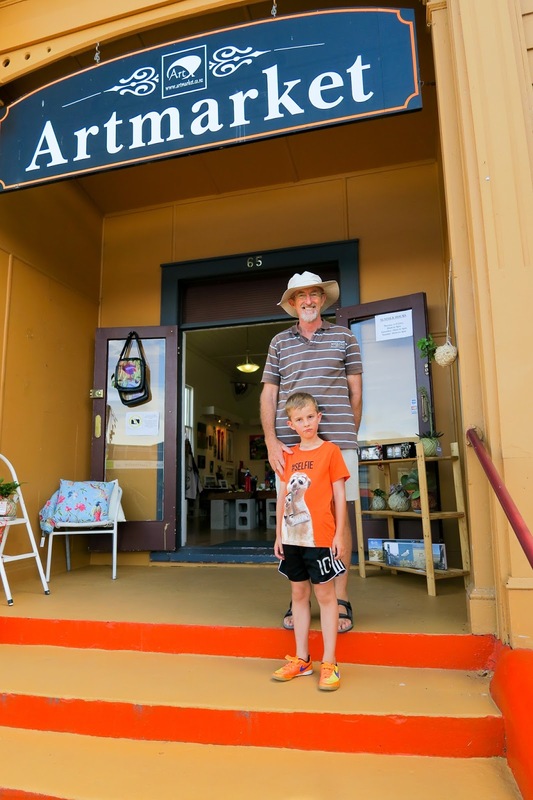 There's plenty of wonderful to be had in Waihi. For a start it's renowned as one of the safest surf beaches in the country. 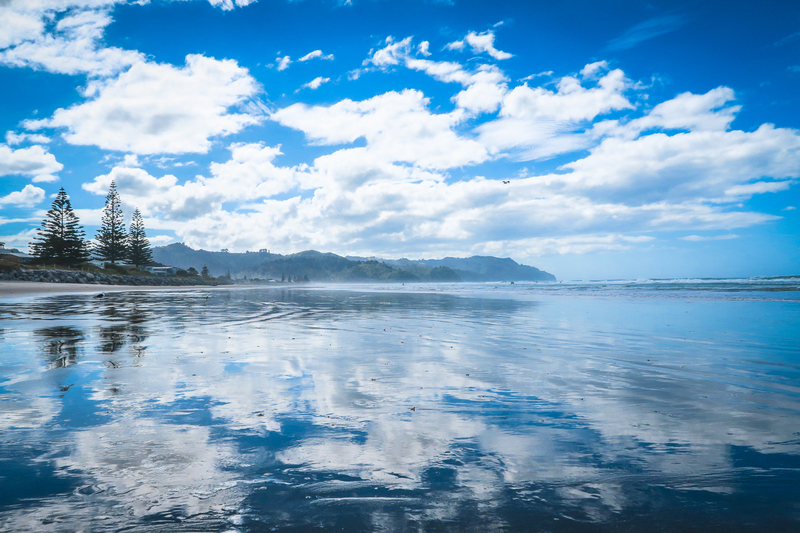 And with 9km of glorious coastline to explore you're sure to find a spot just right to suit you! 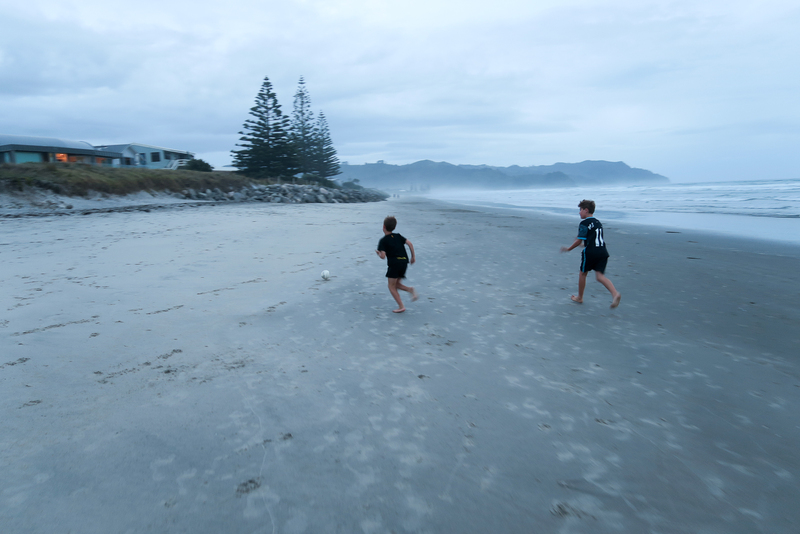 ......or kicking a ball down the beach into the twilight. 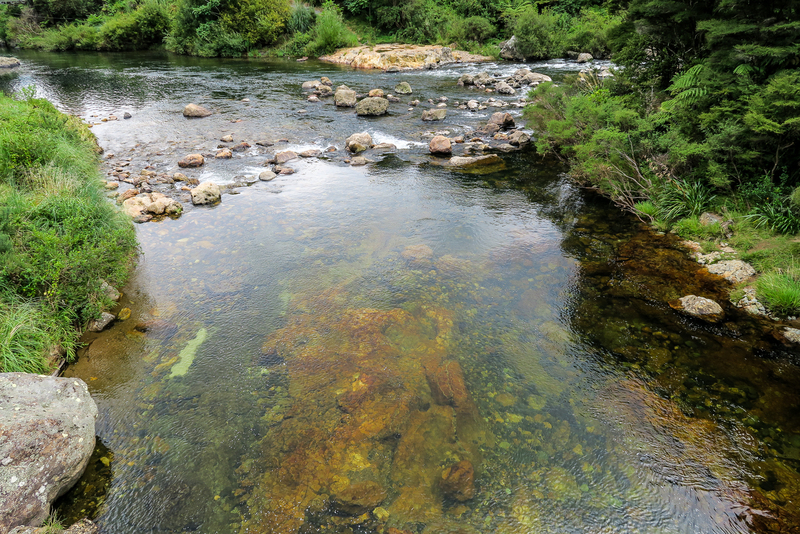 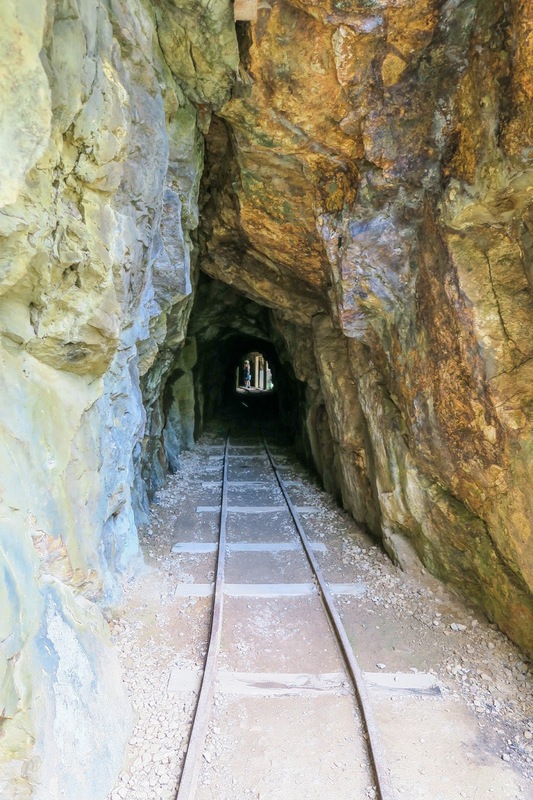 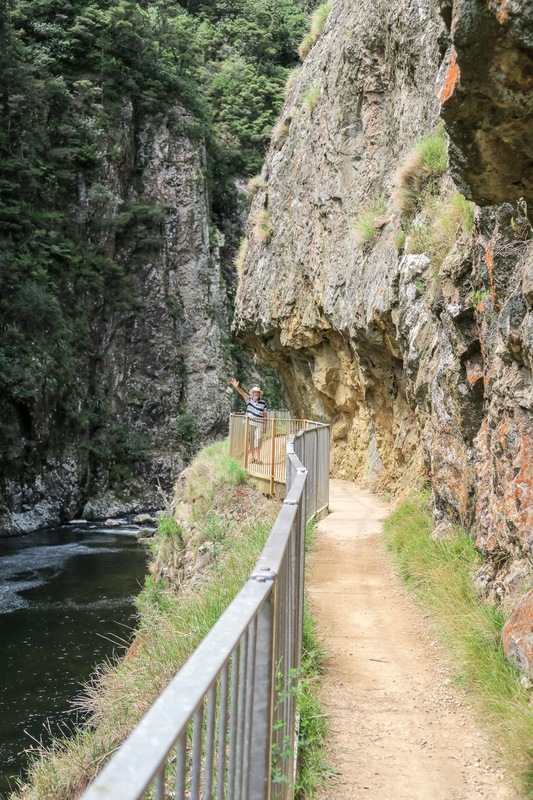 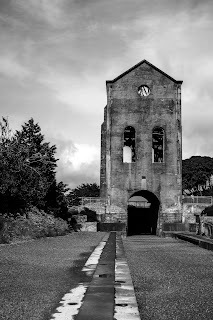 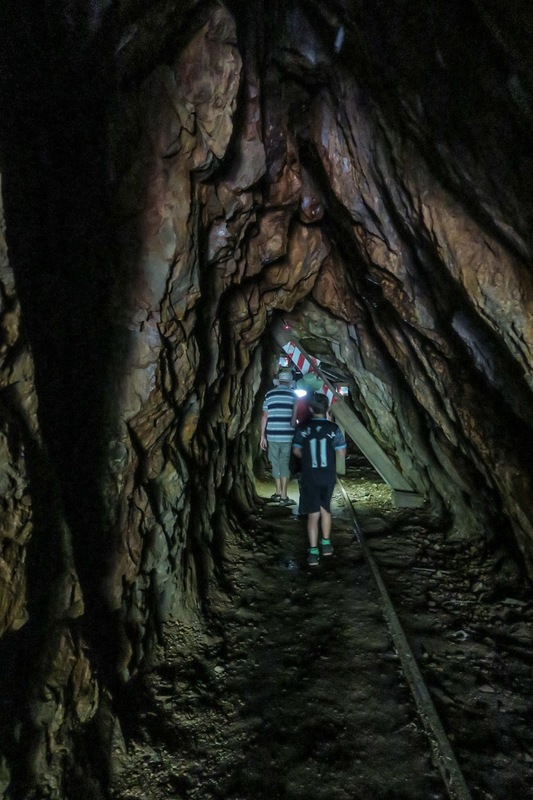 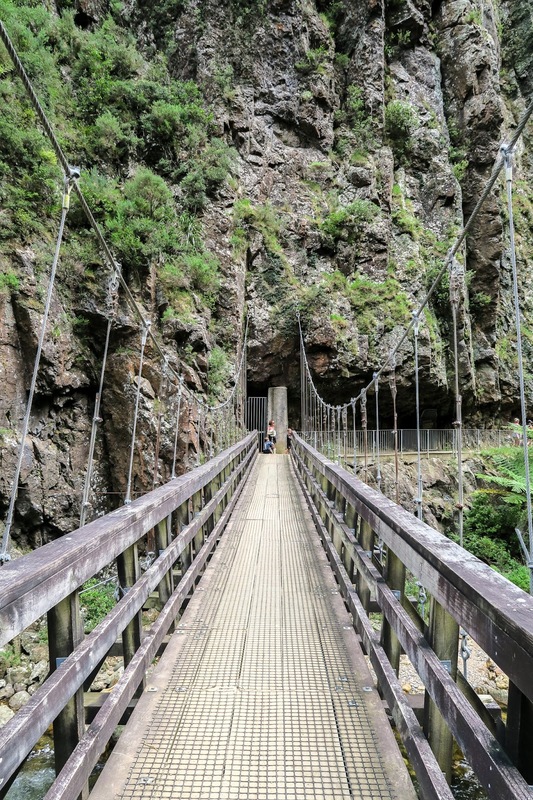 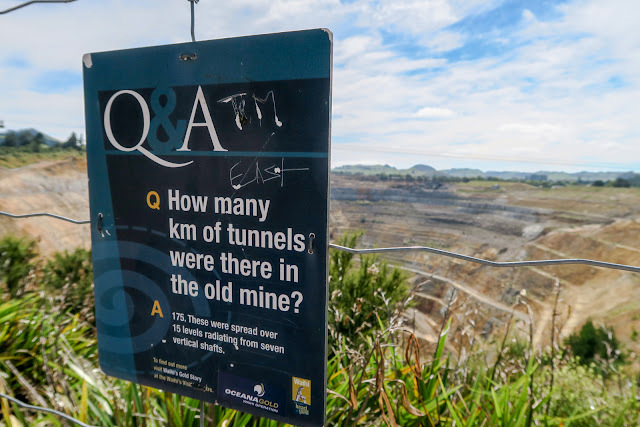 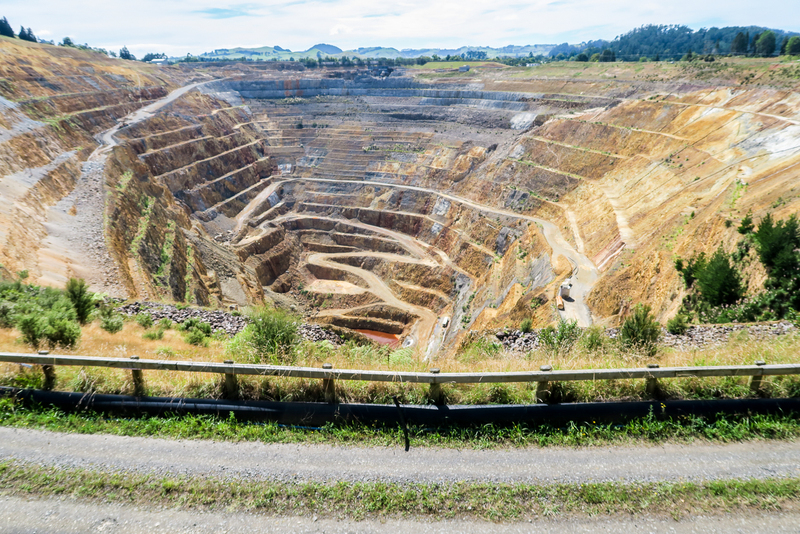 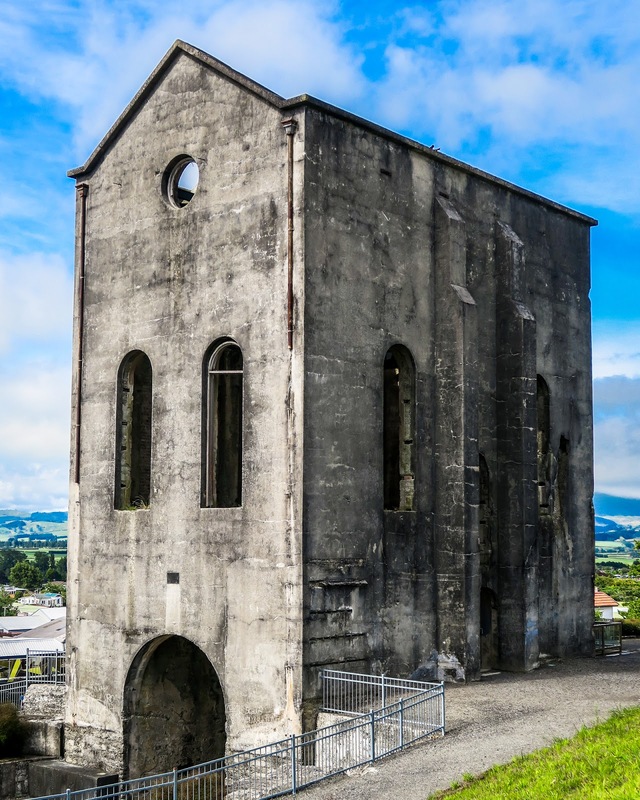 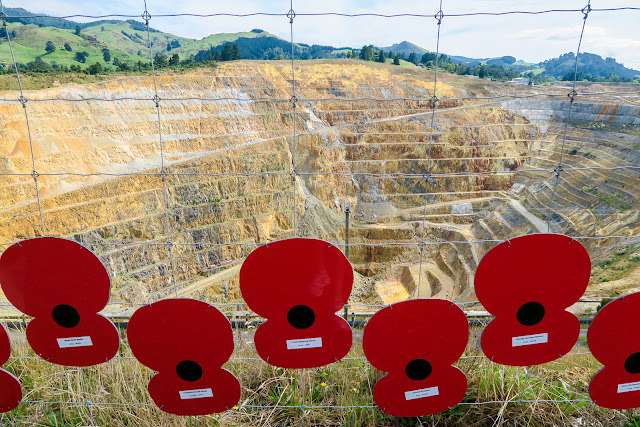 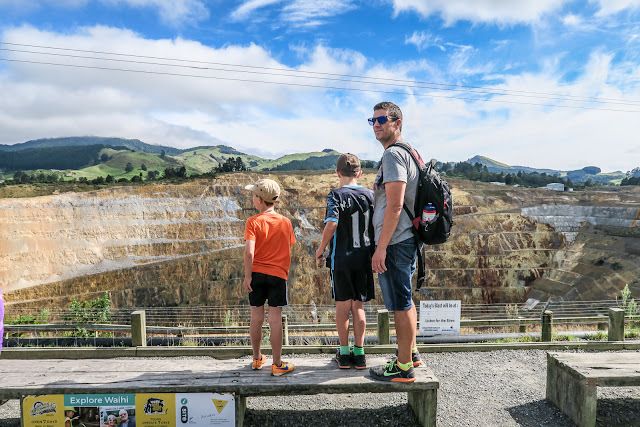 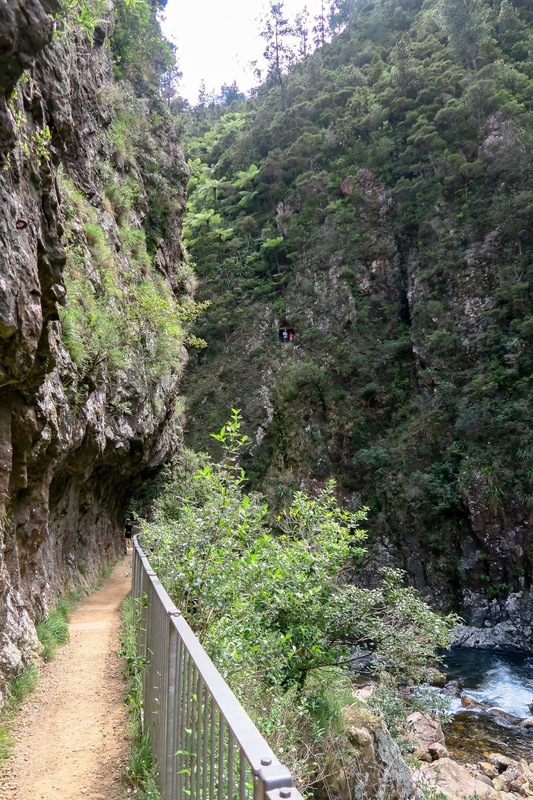 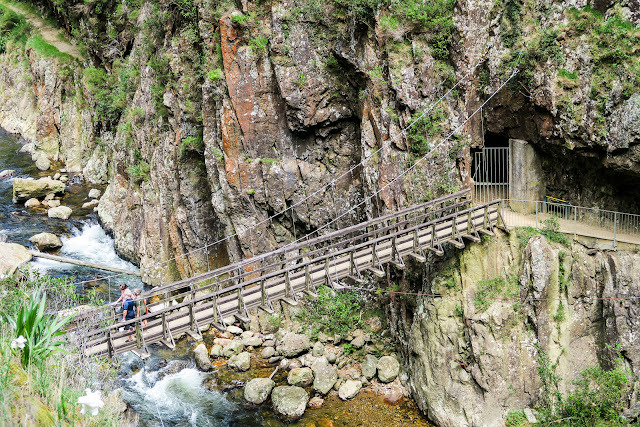 No visit to Waihi would be complete without a visit to the Big Hole otherwise known as the Martha mine. The mine is actually reaching the end of its life now - within the next year or so it will start being filled up - it's going to take 6 years to do so! 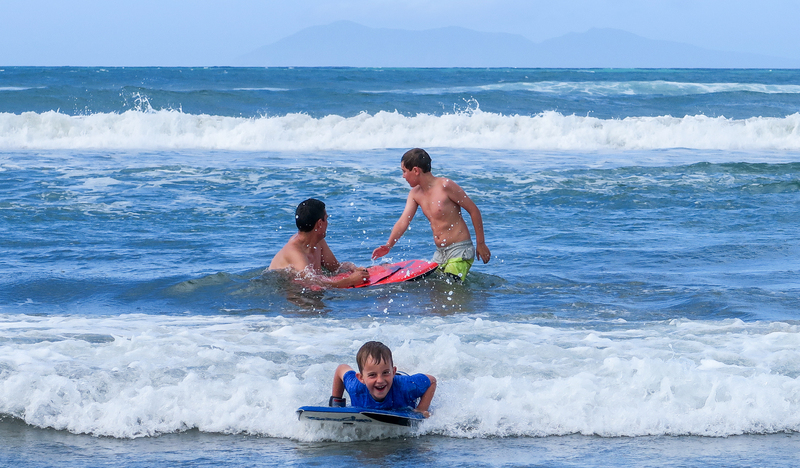 After returning to the beach, it was time to hit the waves. 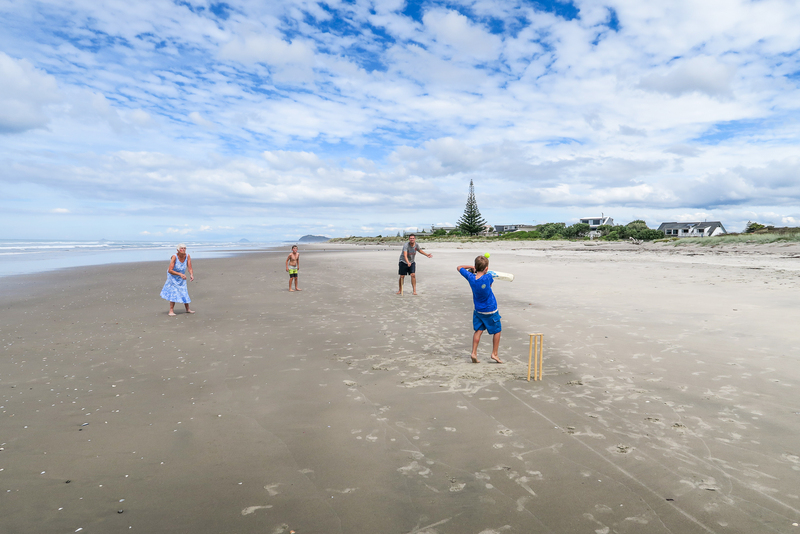 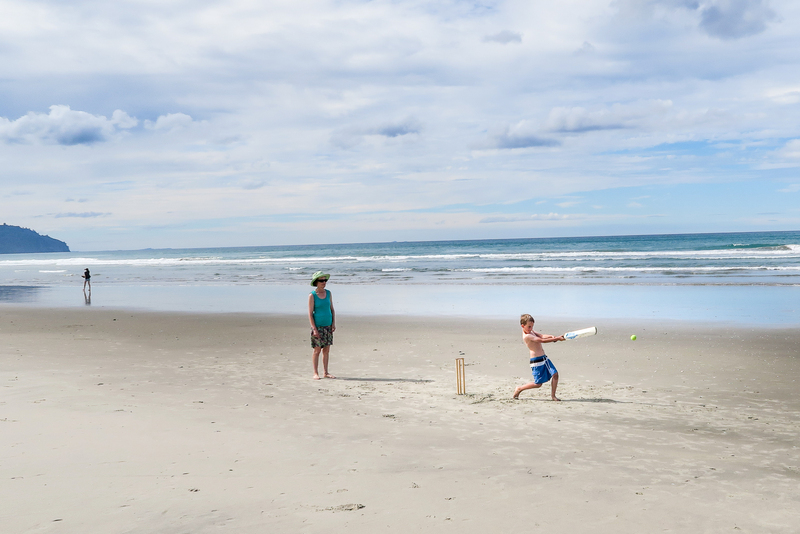 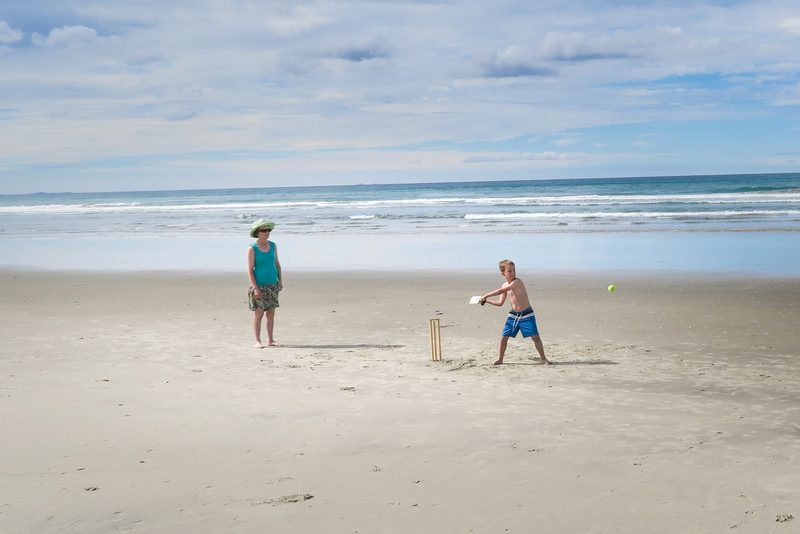 Only after a good long dip had we cooled off enough to want to contemplate some beach cricket. 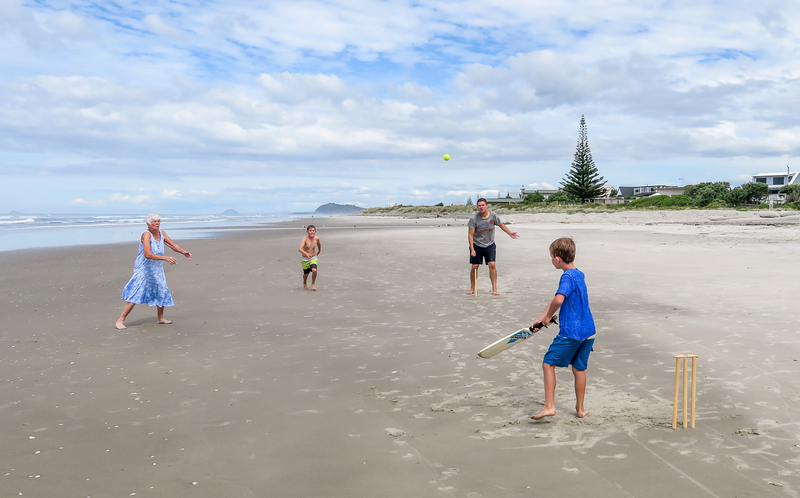 All the grandparents took a turn playing too which the boys loved! 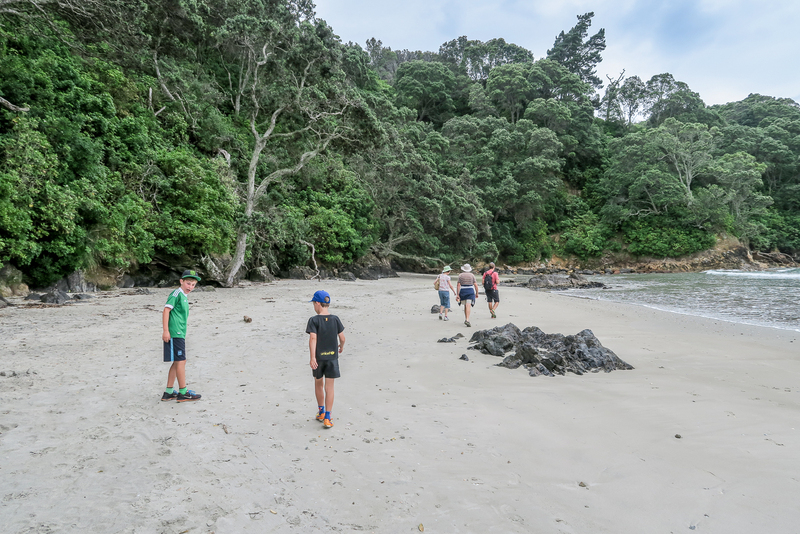 The following day we got out and about early knowing that bad weather was on its way. 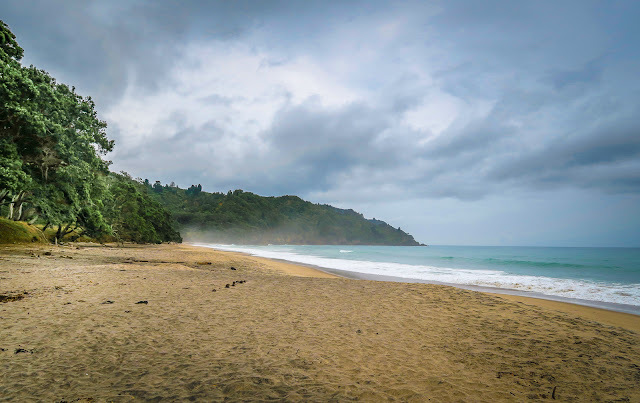 At the very northern end of the beach there's an invigorating 45 minute walk over the headland to the beautiful Orokawa Bay. Even leaving as early as we did a misty drizzle followed us all the way there and back but it was still warm though despite the grey day. We were so lucky to get back to the car just in time for the heavens to open and it then didn't stop raining for 24 hours! And as for the two sunrises I crawled out of bed to capture on two consecutive mornings - holy wow they were amazing - but they will have to keep for another day! 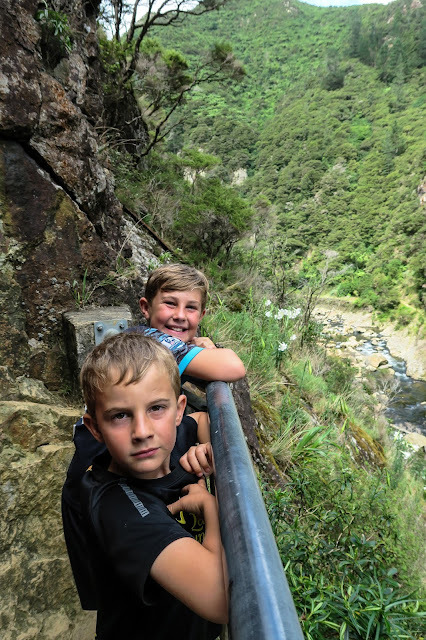 Instead to end with here's a few snippets of real live action from our wonderful time in Waihi..... spot the crazy kids rolling down the hill in the middle of it all! We've been on many an epic adventure around this beautiful country of ours. 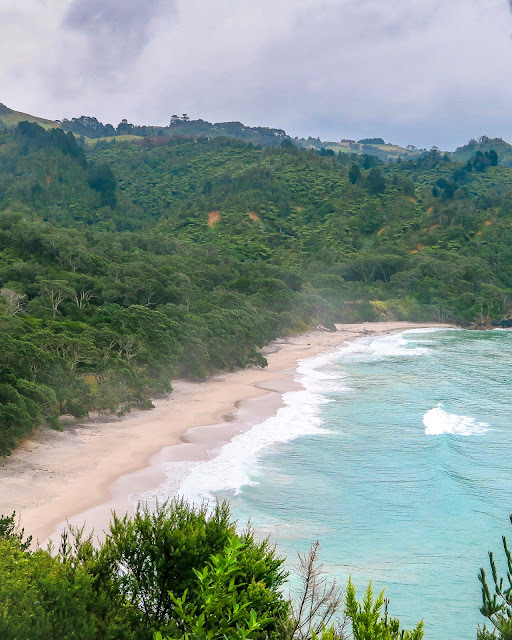 But so far never to the Coromandel. Well not for at least 10 years anyway - on that occasion Coldplay's X&Y album rang out on our journey around the peninsula, and now fast forward 10 years and 2 kids later, it was high time to visit again. And not just because we had Mark's parents here to show off another stunning part of our country. 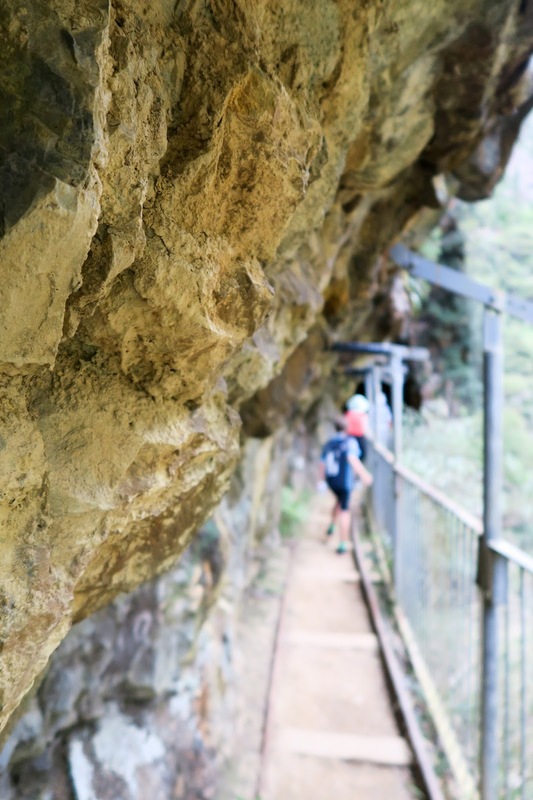 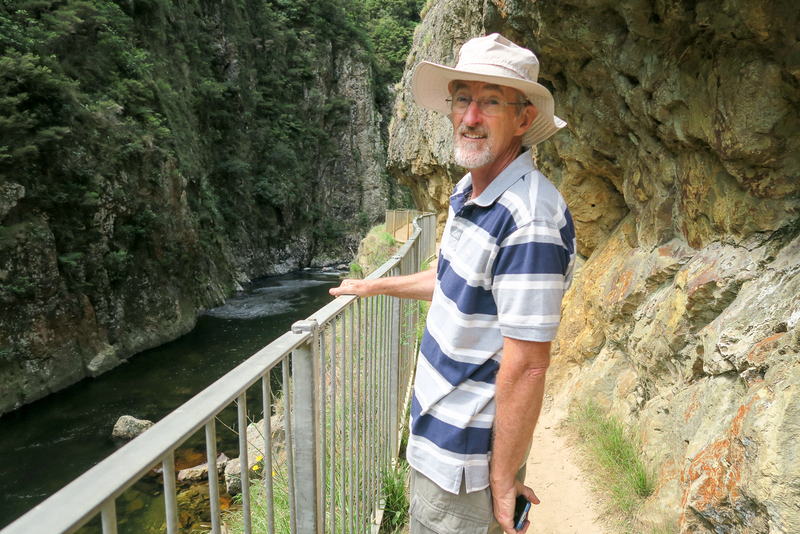 We started our week long trip by heading through the Karangahake Gorge and stopping off to go on the Windows Walk. We'd already been through the Karangahake tunnel last Christmas on a day trip so instead we decided we'd do the Windows Walk this time. 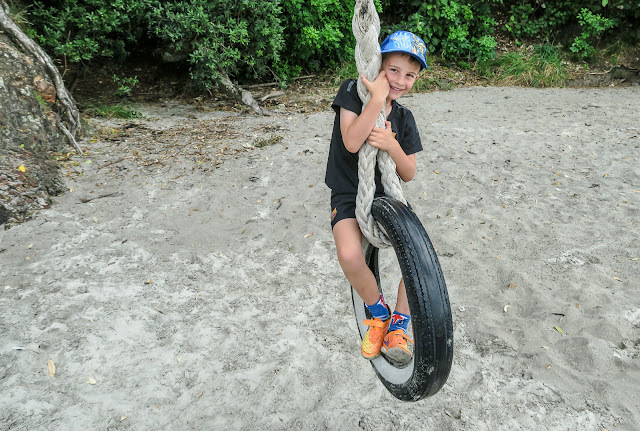 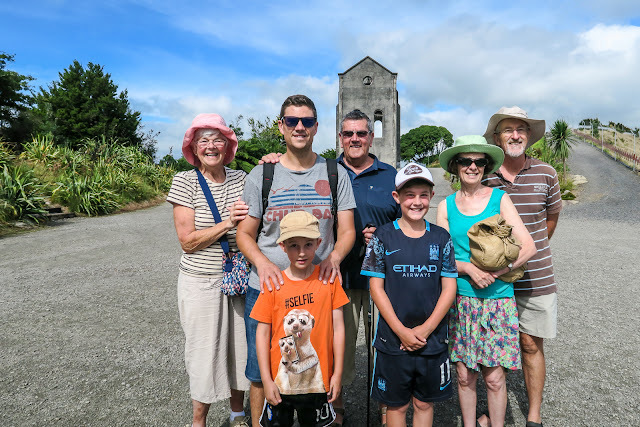 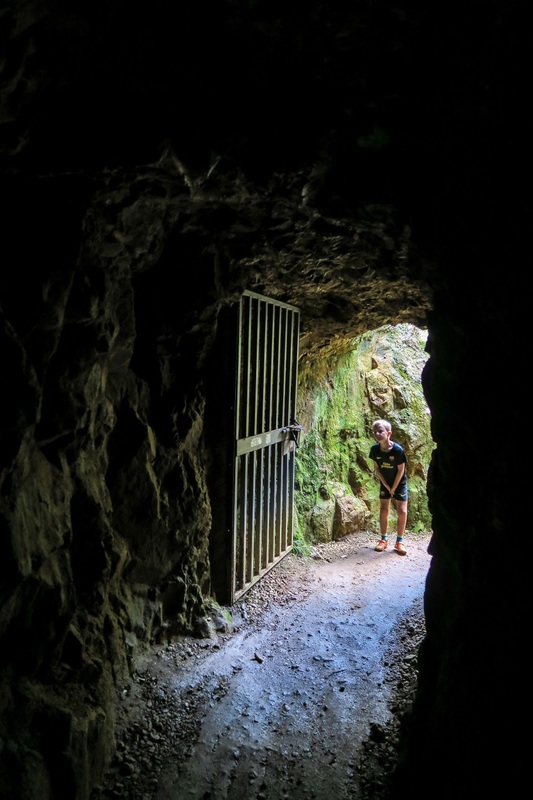 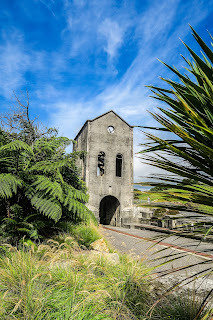 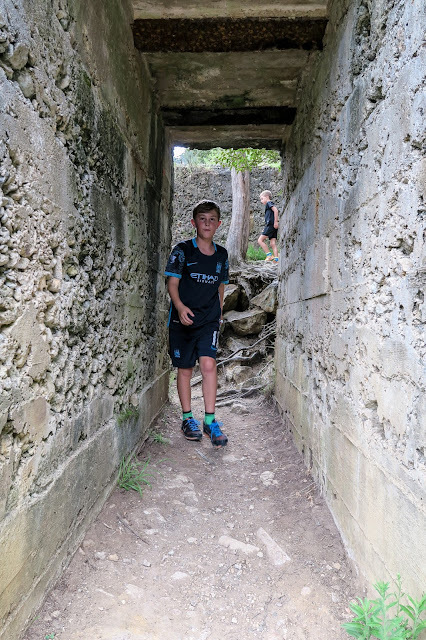 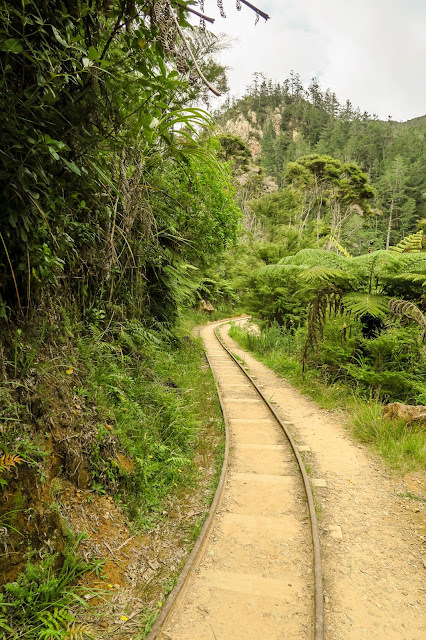 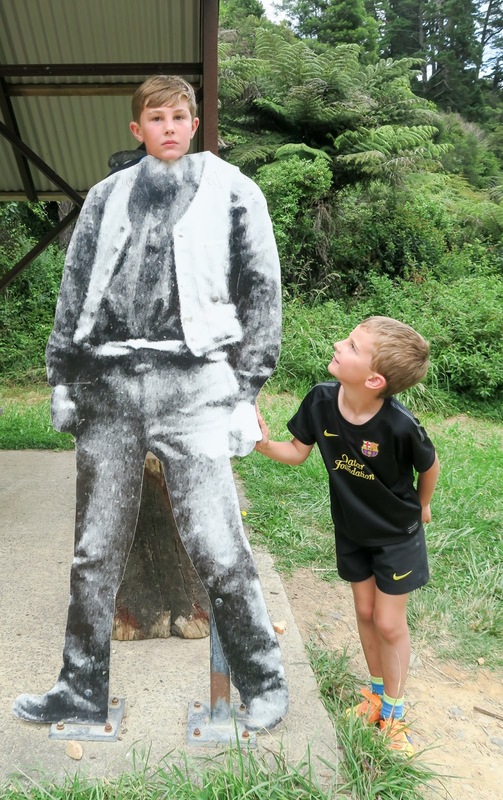 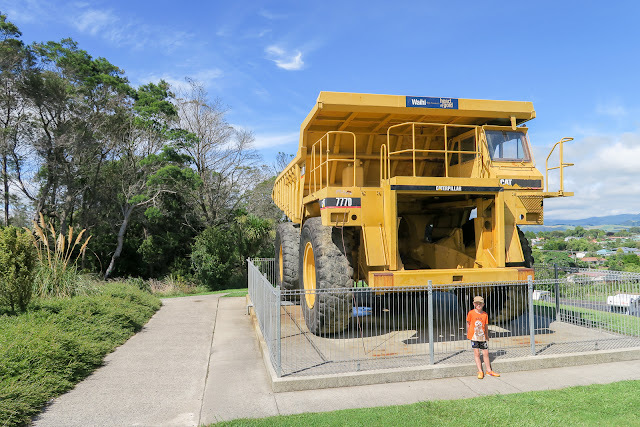 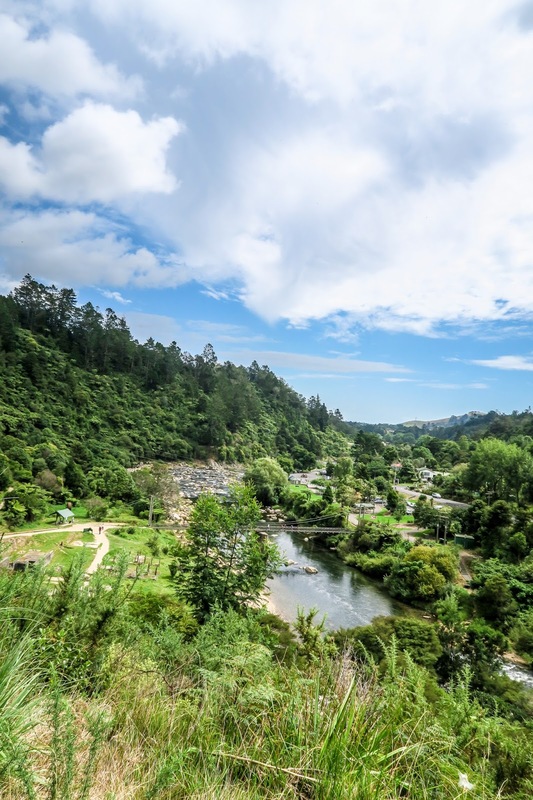 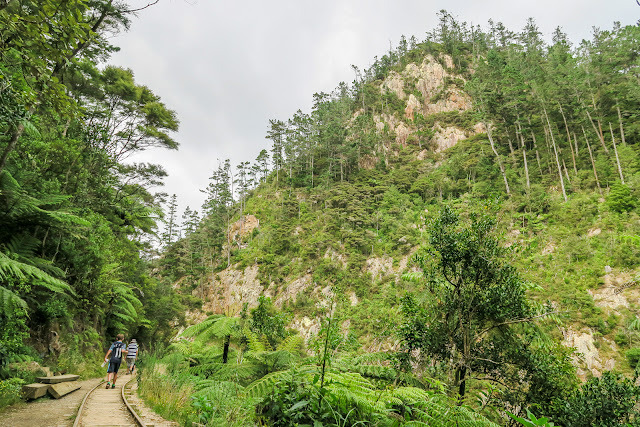 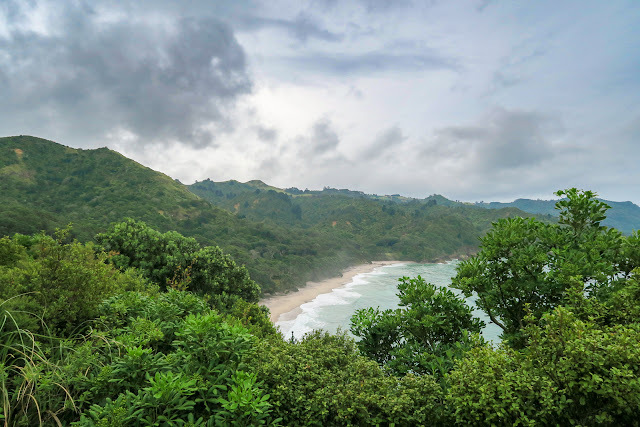 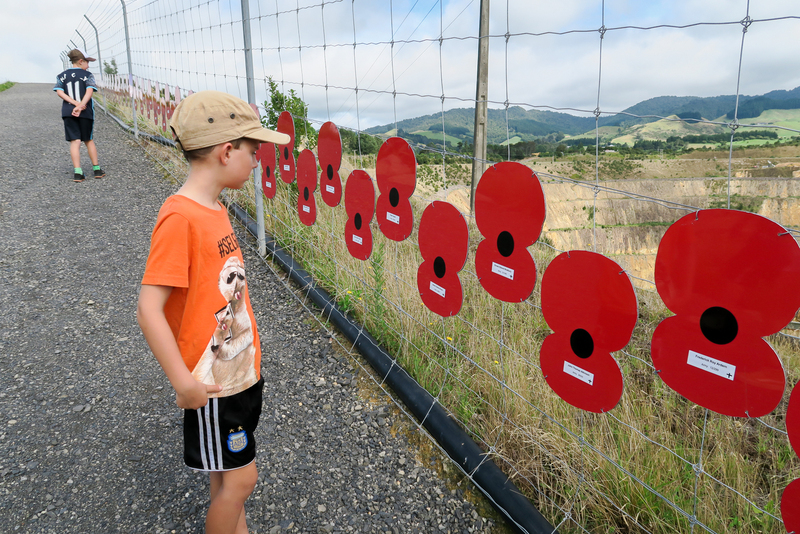 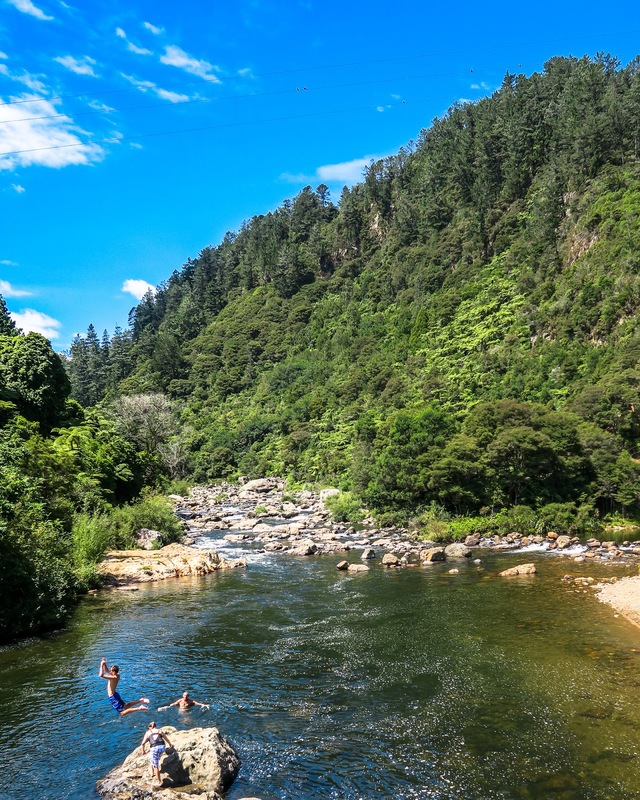 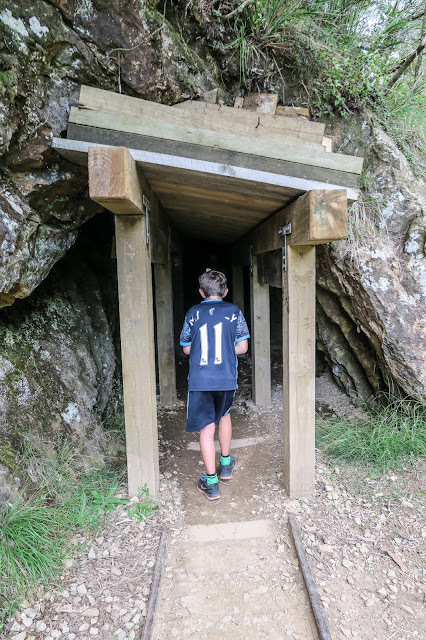 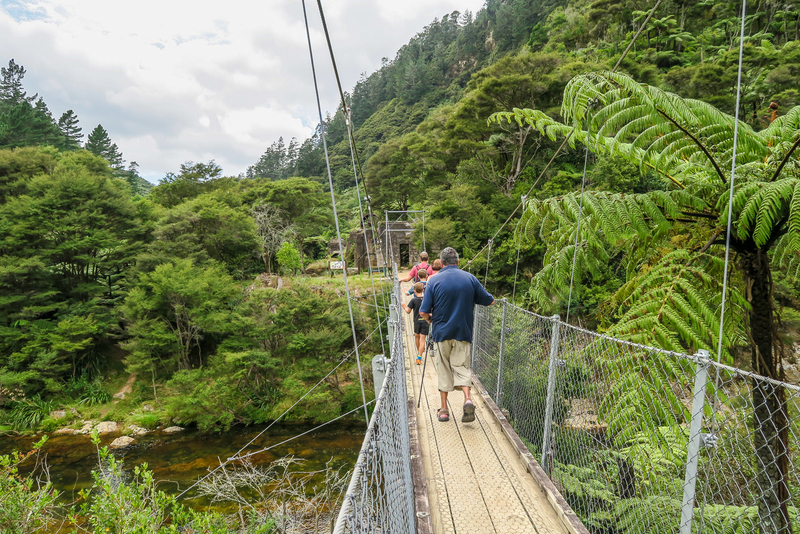 The Windows Walk is a great free family activity in the Coromandel and it's an easy walk which takes about an hour - a little side excursion you can easily plan into your trip onwards to any of the beach towns along the coast. 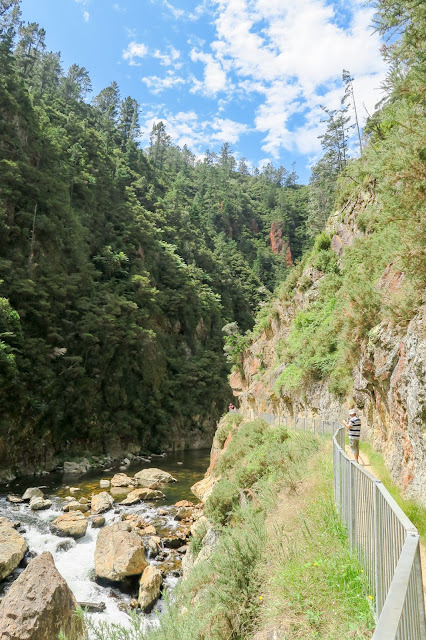 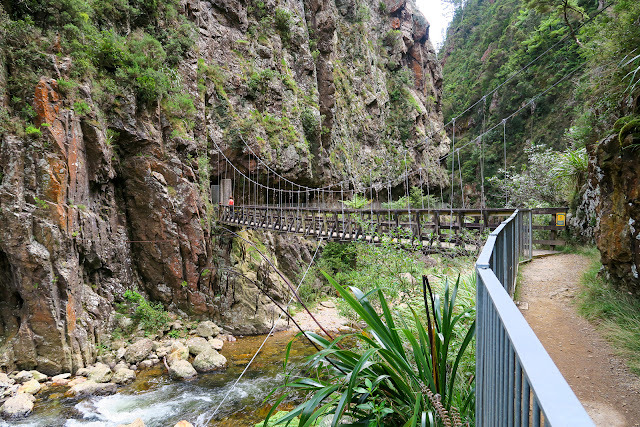 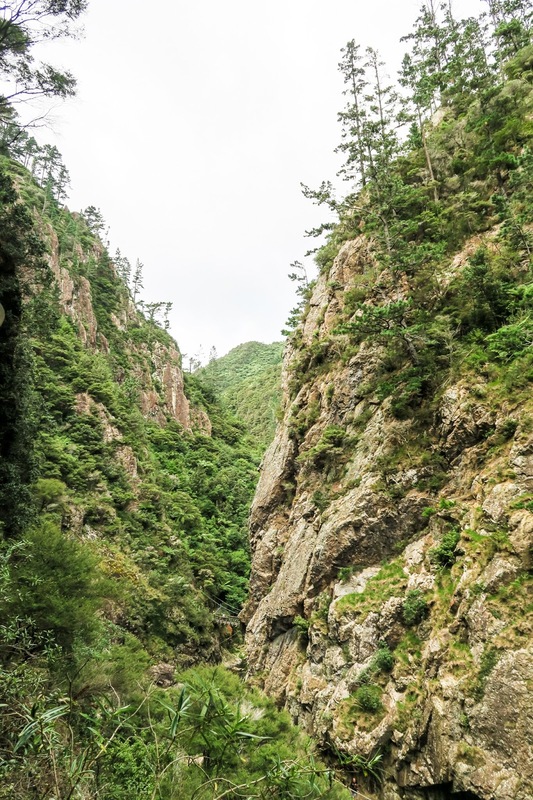 Plus the scenery in the Karangahake Gorge is seriously cool. 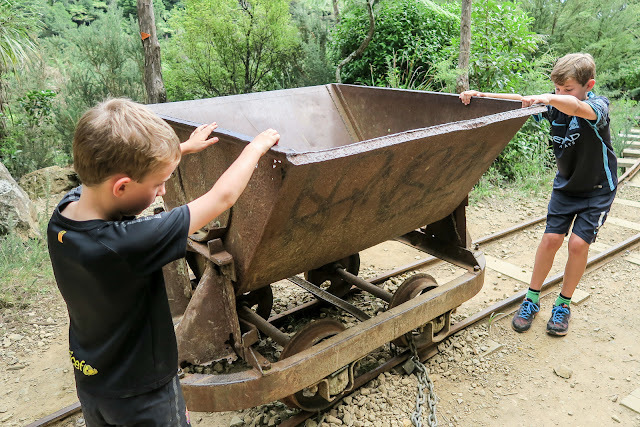 You can very easily imagine yourself transported back to the days of the gold rush and the life these men must have led. The whole area is lush and filled with lots of hidden nooks and crannies. 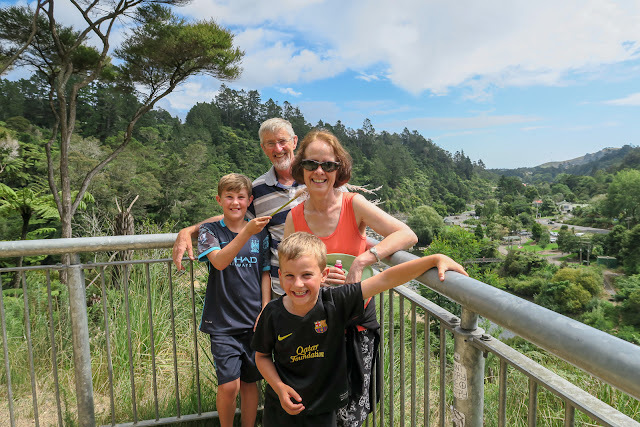 After crossing the swing bridge we separated with Mark and his parents deciding to do the Tunnel walk as it was less steep, while the rest of us headed up the hill into the Windows Walk. 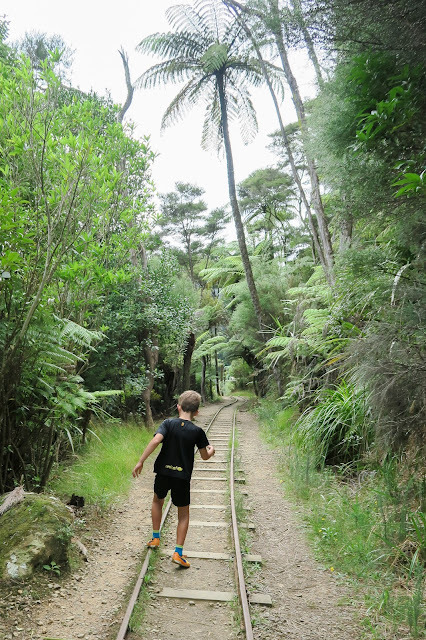 We followed the old railway along to a look out over the whole area. 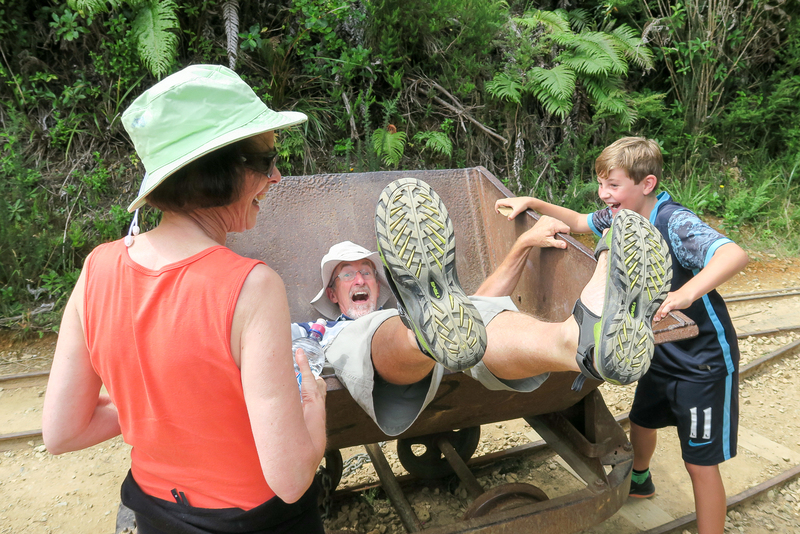 Someone found a toi toi to tickle with - hence the smiling faces in this shot as everyone was trying not to laugh! 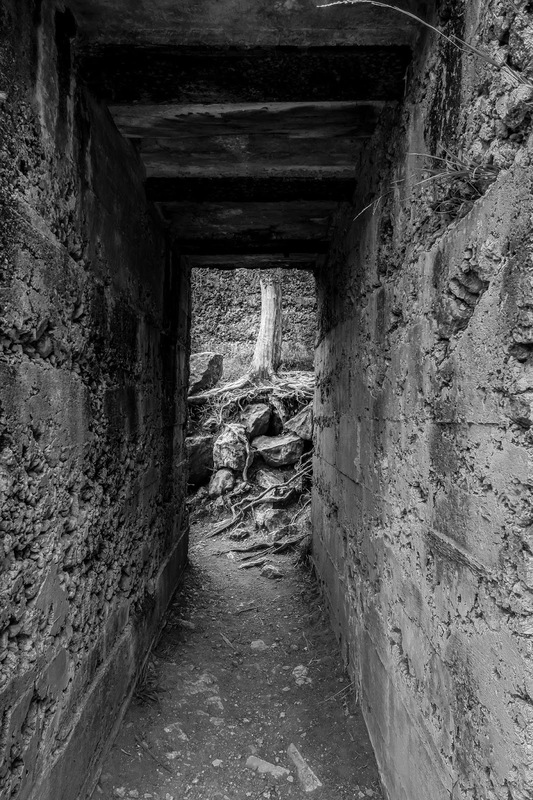 Round every corner there was more to explore. 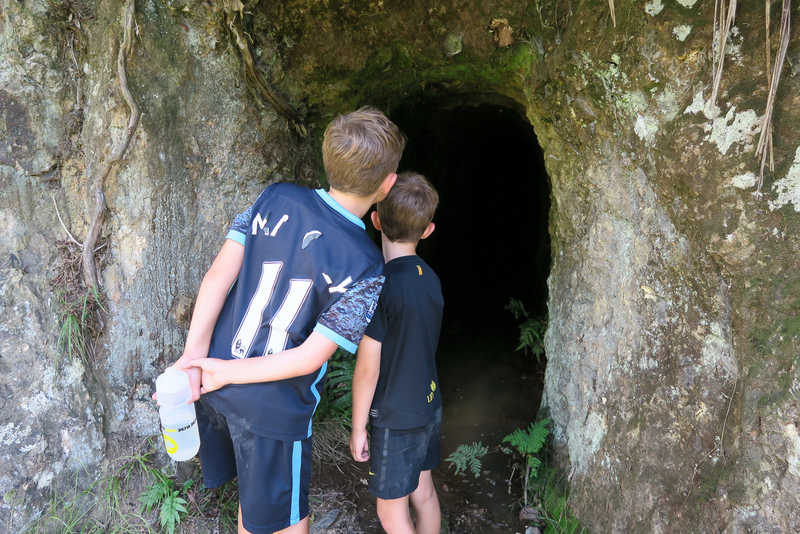 The boys found an old gold mine to jump inside but it was a bit wobbly. 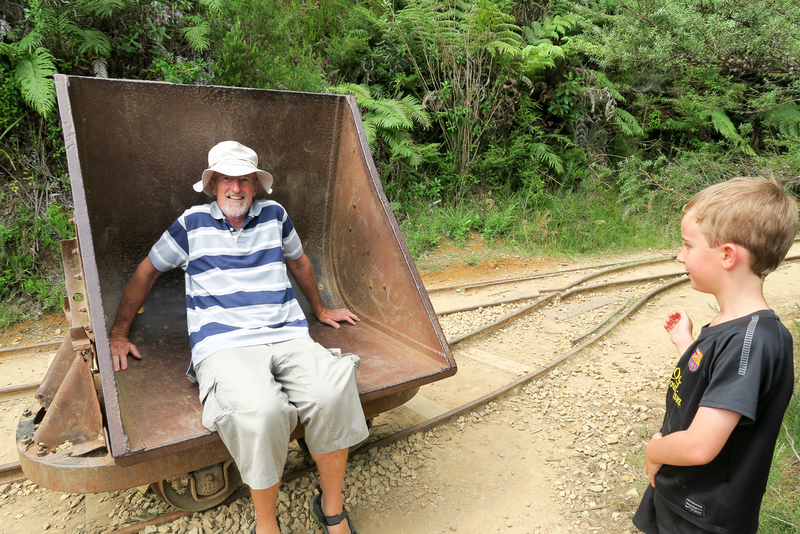 Poppa duly volunteered to be the guinea pig. But I'm not sure whether he was expecting to be tipped completely upside down! 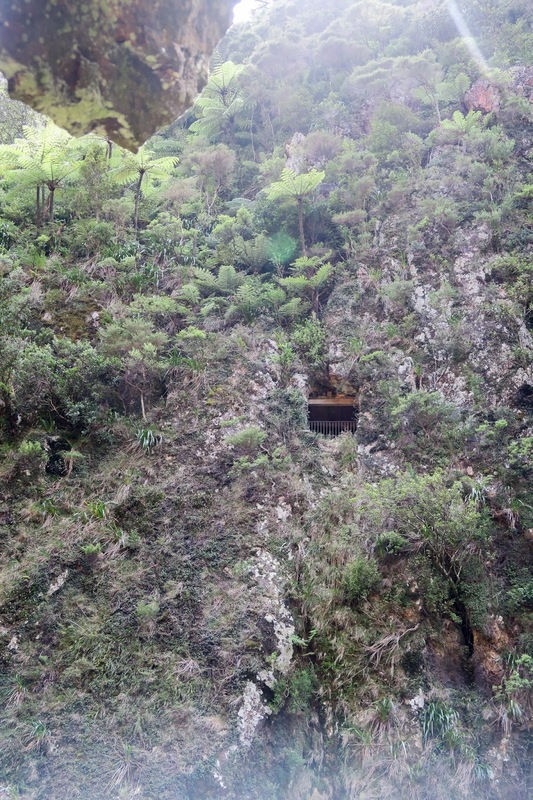 Before long we came across the entrance to the cave windows and headed on in. You do need a torch or head lamp to be able to see where you're going inside since you're walking over the old railway rungs and it would be pretty easy to trip over them - or a trusty phone with a torch will do too. From along the walk, you can see right across the river to the other side of the walk far below. 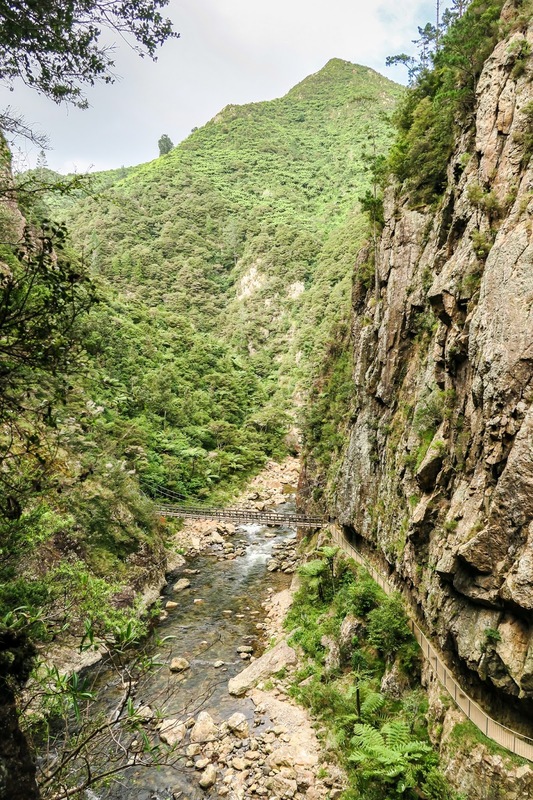 Every so often a little window would open up to look out into the valley. 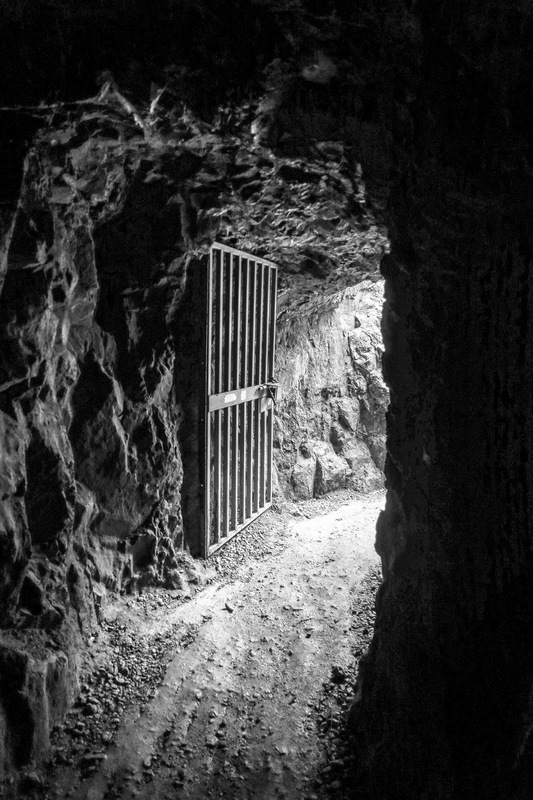 And then it was time to emerge back out into the open again. 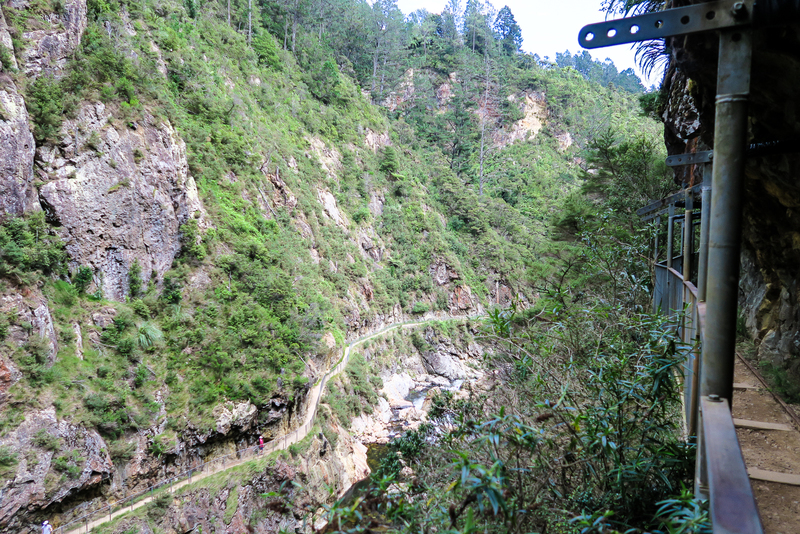 Crossing the river and heading back down the valley from where we'd come. 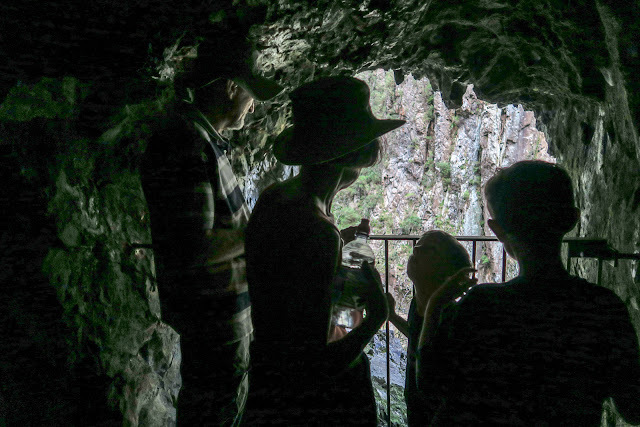 If you look carefully in the picture below, you can see a group of people in one of the windows looking down on us. 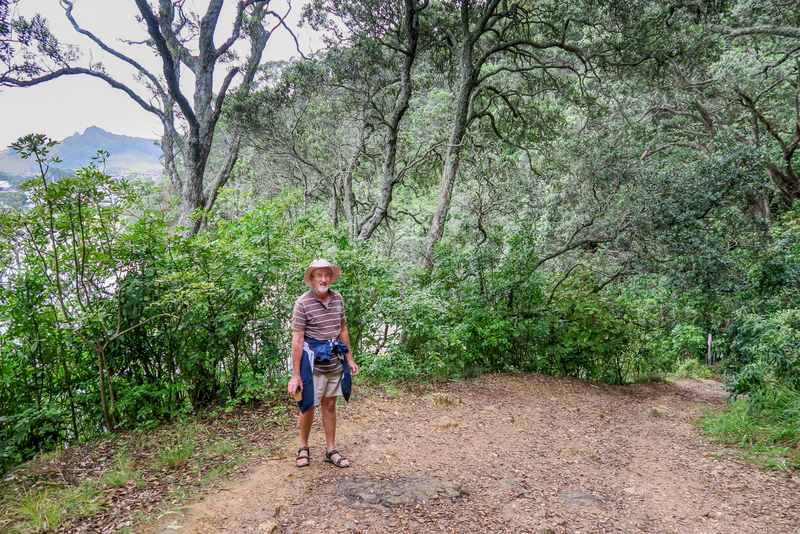 You really have to know what you're looking for to even be able to spot them in the hillside. 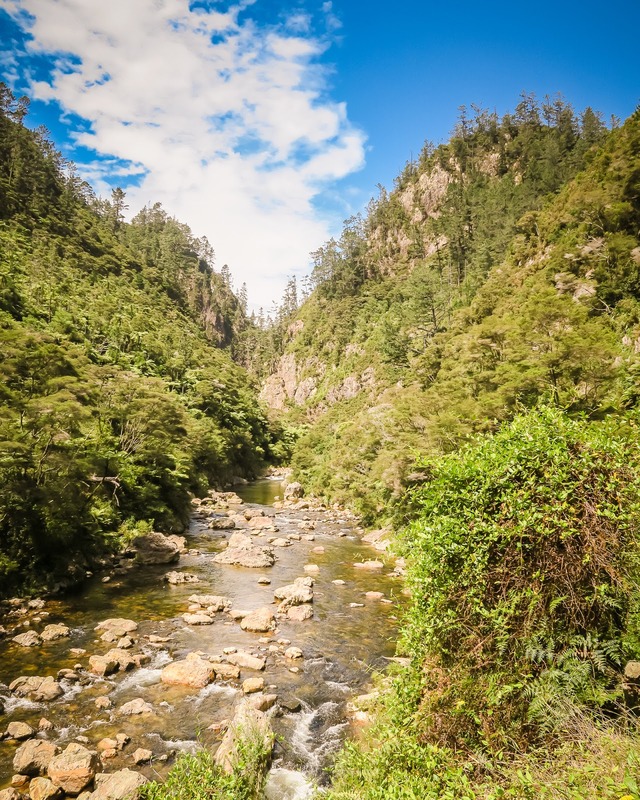 I could have lingered here so much longer - it was so peaceful walking down the valley enjoying the views. 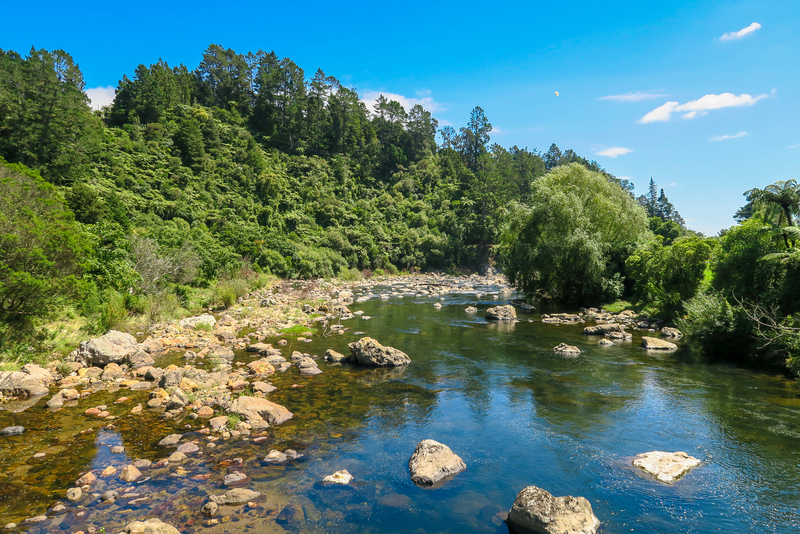 Back down at the main river, the blue skies were reflecting the glorious day, and a few keen swimmers were bombing off a rock - I wished I could have joined them! 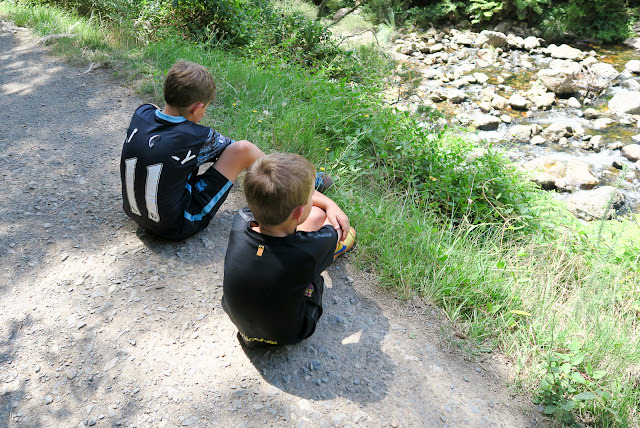 One other spot we made time for before making our way to Waihi Beach was the lovely Owharoa Falls - about 5 minutes further on into the gorge. 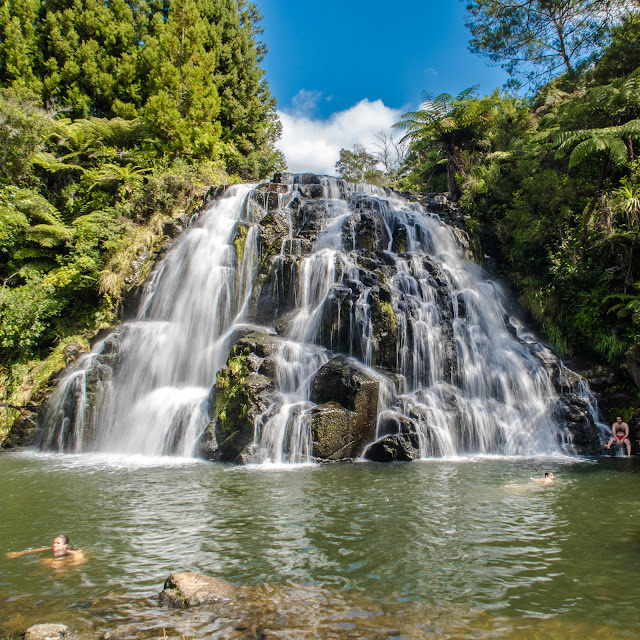 I had high hopes for taking some long exposure shots here but the place was crawling with people all trying to cool off on a hot afternoon. 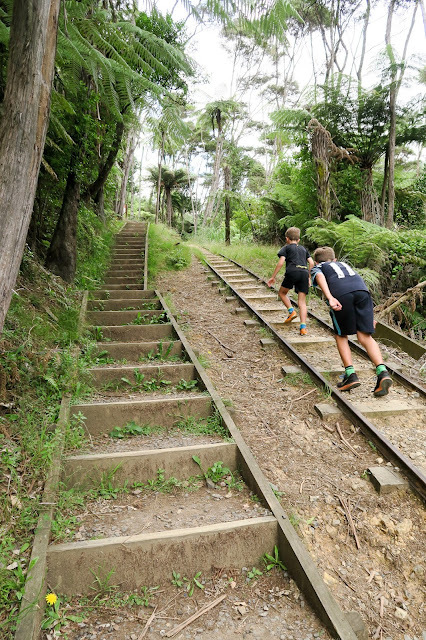 Never mind! 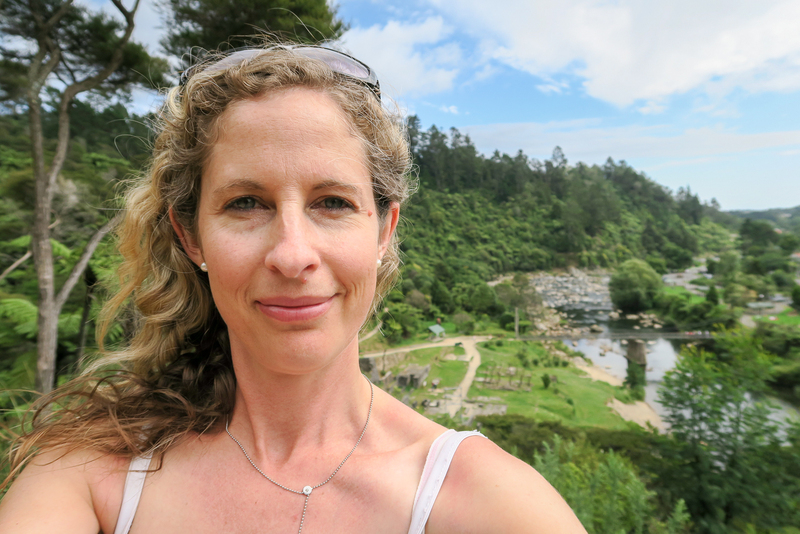 What I am loving about going on holiday in the Coromandel is the fact it's still SO close to home - it's only just over an hour from Cambridge to the beach and there's this gorgeous spot to enjoy along the way - win win in my opinion!